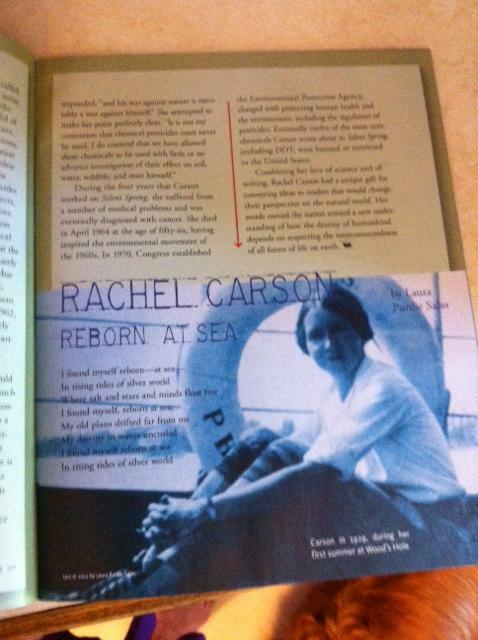 While working on poems to submit for Dare to Dream, the fantastic new anthology edited by Jill Corcoran, I wrote two poems about environmental pioneer Rachel Carson. Jill chose a different poem, but I’m excited to say that both my Carson poems will be shared publicly. This first one, a triolet, is in the September issue of Cricket Magazine. It’s my first publication in Cricket, though I’ve been in Spider before. So excited! In the magazine, the poem is paired with a terrific feature article about Carson that they already had planned when I sold them my poem earlier this year. Talk about a fast turn-around! And there’s a picture of Carson on her trip to Woods Hole the year she first saw the ocean. So cool! In case you’re not familiar with Carson, here’s a little background: Rachel Carson planned to be a writer, but her college science classes so intrigued her that she switched her major to biology. In 1929, at age 22, Rachel went to study for six weeks at the Marine Biology Laboratory in Woods Hole, Massachusetts. She saw the ocean for the first time and fell in love with it and its creatures. That and her fervent belief that all animals, including humans, are connected to and dependent upon each other led to her many books, including Silent Spring (1962). Silent Spring documented the effects of pesticides on our natural world and helped launch the environmental movement. Sylvia Vardell at Poetry for Children has the Poetry Friday roundup. Speaking of fantabulous anthologies, I hope you’ll check out the Poetry Friday Anthology. It is amazing! Laura, I am a big fan of poems about/inspired by historic women.. thanks so much for writing this one and congrats on CRICKET! Your poem is beautiful!!! And congruatulations! Thank you, Penny. It was fun to do a triolet (not a form I work often in). Many congratulations, Laura! I love the rolling beauty of your poem, and it looks great on the page too! This week I’ve been helpig the librarian weed the books as we re-shelved them. We finally got to the poetry books this morning and I was so excited that Chatter, Sing, Roar, Buzz was on our school shelf! Congratulations! What a great sale! A masterful triolet, Laura. Brava! Thanks so much, Pat–that means a lot! I’m so proud of you Laura! Also I love your poems in TPFA. You put on a poetry form smackdown. SALAS POWER!